Sleep Dentistry involves any sort of dental care performed while a person is fully or partially asleep. Using Nitrous Oxide Gas, drugs given in pill form or through an I.V. (tube connected directly into a blood vessel through a special needle), anesthetic gasses or a combination of these, a person can sleep through treatment. What is anesthesia and what are my options of anesthesia for dental work? Anesthesia (from the Greek; not feeling) refers to any method used to eliminate feeling or pain. There are two main classes of anesthesia in medicine and dentistry: general and local. General anesthesia refers to not only the elimination of feeling but also the loss of consciousness. By the administration of drugs, the person receiving the general anesthesia essentially goes to sleep -- a deep sleep. During the procedures, their health and breathing are monitored by special doctors to assure safety. While the person "sleeps" procedures are done without any pain or discomfort. Local anesthesia concerns the loss of feeling in a specific area of the body. The drugs for local anesthesia are placed at or near the site of the work and eliminate any feeling just in that area. In dentistry, these are often referred to as Novocaine injections. With local anesthesia the person is awake and aware yet feels no discomfort. What is the difference between anesthesia and sedation? Anesthesia specifically deals with the elimination of feeling or pain. Sedation refers to consciousness or awareness. It is an altering of perception that allows a person to be calmer and more relaxed which often reduces the perception of discomfort. In dentistry, sedation is used to calm a person and used with a local anesthetic to eliminate the feeling of pain. General anesthesia uses drugs to produce a deep, unconscious sleep state. While under general anesthesia, a person is fully asleep and unresponsive to questions and commands. General anesthesia is used primarily in hospital or surgical center environments and is administered (provided) by Anesthesiologists (Doctors) or specially trained Anesthetists under a doctors supervision. People who wish a great deal of care to be done at a single visit. The word phobia means "fear" or "dread." It is an extreme, and often debilitating, fear. Dental phobia indicates a fear of dentistry so strong that it prevents a person from even visiting a dentist. The fear itself can have many causes. In its simplest form, the fear is based on unpleasant or painful experiences with dental care in the past. Most often these experiences occur when a person is very young and highly impressionable, leaving them uncontrollably fearful as an adult. If you have any other questions about sleep or sedation dentistry. 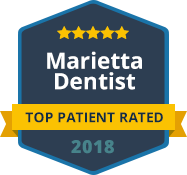 Please call or contact our Atlanta Sedation Dentistry office today.